Indian Spiced Quinoa was inspired by a recipe I found on chow.com from Ann Gentry’s The Real Food Daily Cookbook: Really Fresh, Really Good, Really Vegetarian. I wanted to intensify the Indian flavor so I added curry powder and a bit of cayenne pepper. I used Bob’s Red Mill quinoa. The package assured me that it had been rinsed well so I didn’t do that. If you’re using quinoa that hasn’t been rinsed, you need to put it in a very fine mesh strainer and rinse it well until the water runs clear. This removes the naturally occurring saponins which can cause a bitter taste. Last night, Indian Spiced Quinoa was the perfect side dish with some sautéed shrimp. Today it was great cold right out of the refrigerator. I would gladly pack it in my lunch on the days that I’m substitute teaching! The spices are a bit assertive, but we like it that way. Cut back on the garam masala, curry powder, and cayenne if you want a milder dish. 1. Bring the 2 cups of water to a boil in a large saucepan. Add the first ½ teaspoon of salt and the quinoa. Bring to a boil, reduce heat to medium low, cover and simmer for about 12 minutes, until the water is absorbed and you can see the little quinoa “tails”. Remove the pan from the heat. Fluff with a fork, cover and let it sit for 15 minutes. 2. 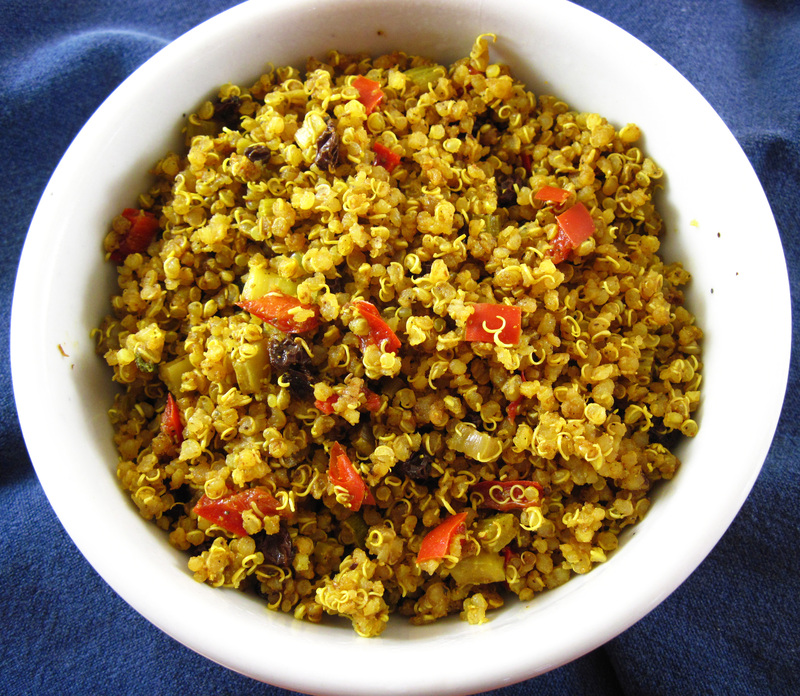 While the quinoa is cooking, heat ½ cup of water to boiling in the microwave. Add the currants to the water and let them soak for 20 minutes so they plump up. 3. Heat the toasted sesame oil and butter in a large skillet. Add the garam masala, curry powder, cayenne pepper, and remaining ½ teaspoon of salt to the skillet. Cook, stirring for about 1 minute until the spices are fragrant. 4. 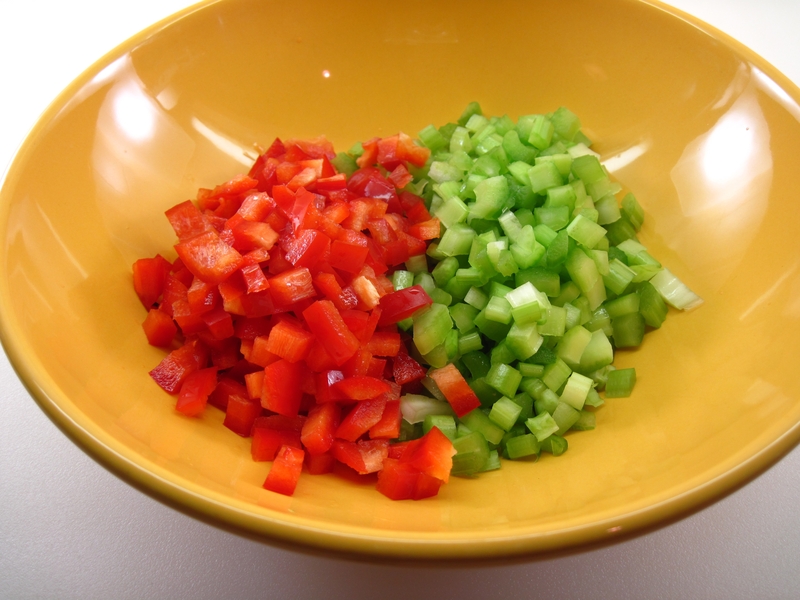 Add the celery and red bell pepper to the skillet. Cook for about 2 minutes; add the green onions and cook for about a minute more. 5. 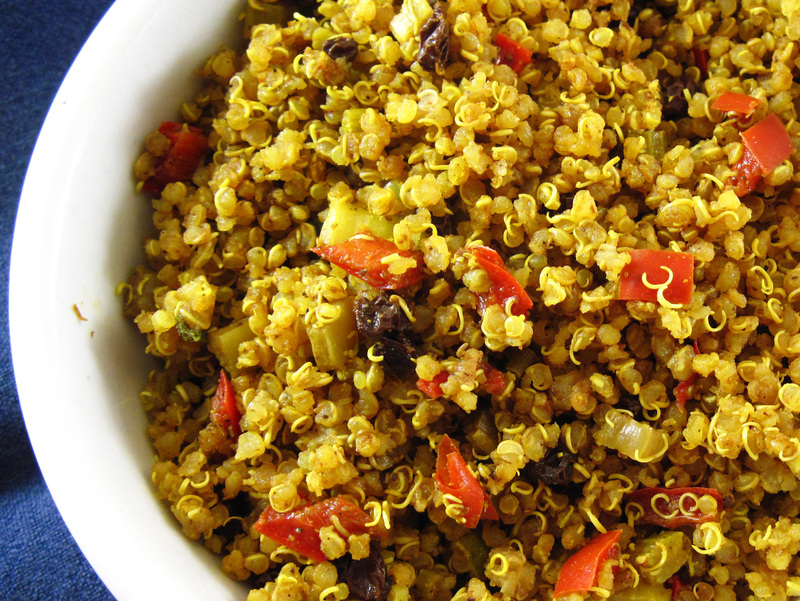 Mix the quinoa and currants into the celery mixture. Toss gently with a fork until well combined. May be served warm or at room temperature. I’ve got a kale-quinoa-dried tomato-kalamata olive salad that I could eat for lunch everyday of the week. That was, however, before I saw this recipe. Yum! Your salad sounds like a fantastic combination, Debra! I’m going to have to try this. I LOVE quinoa!